In September of 2015, the member states of the United Nations agreed upon a 15 year blueprint to tackle the world’s most troubling problems in an effort to end poverty, fight inequality, and reverse climate change. The University Network believes that all students and educators should be aware of these goals and thus have created this scholarship to help get the word out. Today’s students are the first generation that may be able to end extreme poverty and the last generation that may be able to to reverse climate change. ➯ Create a video explaining why the Global Goals are important and post it to Facebook or YouTube. ➯ Create an infographic illustrating the importance of the Global Goals and post it to Twitter, Facebook, or Pinterest. ➯ Write an Essay of 500 words or less explaining the importance of the Global Goals and post it to Medium, Linkedin, or Facebook. 🔹For Facebook submissions (whether video, infographic, or essay): tag us and use the hashtags #SharetheGoals and #TUNscholarship at the end of your post. Also include a link to this scholarship post in your submission. 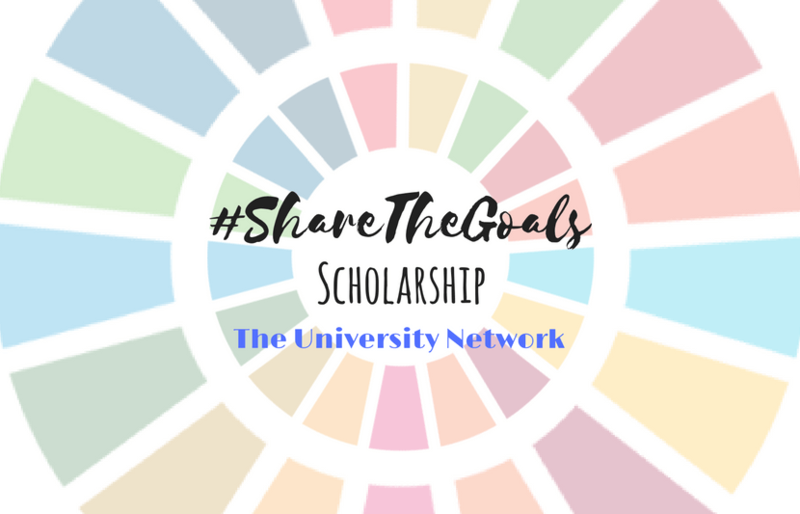 🔹For Youtube submissions: videos should be titled “#ShareTheGoals Scholarship – The University Network – Your Name.” Include a link to this scholarship post in the description box. 🔹For Pinterest submissions (for infographic): use the hashtags #SharetheGoals and #TUNscholarship in your pin description and link your pin to this scholarship post. The infographic must detail your ideas. 🔹For Medium or Linkedin submissions: include the link to this scholarship post at the end of your essay. 🔸Email us the link of the video, infographic or essay at GlobalGoals@TUN.com to be officially entered. No Poverty – End poverty in all its forms everywhere. Reduced Inequalities – Reduce inequality within and among countries. Climate Action – Take urgent action to combat climate change and its impacts. Current college students or high school seniors, attending school in the United States, or an educator at any level teaching in the United States. Children or grandchildren of employees, officers or owners of TUN, Inc.
By applying for a scholarship, applicant grants TUN permission to post their name on TUN.com or in other marketing communications in the event they are awarded the scholarship. Scholarship recipients will be required to submit a current photo and a publicity release granting TUN permission to use their photo on TUN.com and in other marketing communications. First Place – $5,000 – One winner – awarded on July 15, 2017 – the winner will be picked from the pool of monthly winners. Second Place – $500 – 10 winners – awarded each month from September 2016 through June 2017.